Proper diaphragmatic activation during movement and activation of the deep stabilizing system of the spine (DSSS) is one of the core principles of the whole-body approach at Capital Chiropractic & Rehabilitation Center. Without this activation, the body with compensate with poor movement patterns. Mobility is a tremendous buzzword in sports and rehabilitation. And, without a doubt, mobility is very important. Muscles and joints are meant to move, to move often, and without restriction. However, what is often overlooked, is the need for stability in certain areas of the spine and extremities. Often, when we lack stability, our body has to compensate. Unfortunately, when your body compensates, it does so by reducing our mobility. Muscle tightness and joint restrictions are often the result. We must look at movement patterns to first address lack of stability, before we address mobility. Otherwise, we end up focusing on mobility too much, and we miss the big picture. This is like trying to bailing water from a boat, rather than plugging the hole. Although this concept has existed for decades throughout Eastern Europe with Dynamic Neuromuscular Stabilization (DNS), this new paradigm is only now making an impact here in the United States. At the root of it, we must rethink our breathing. Let go of the tight belly myth and let your abdomen expand with each inhalation. From there, we begin to relearn stability, form, and function. 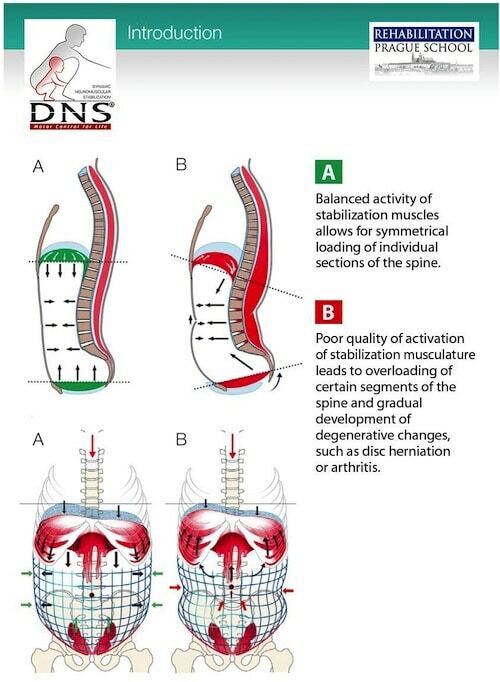 For more information, see our posts on CORE STABILITY, DNS Golf, and DNS C.
For treatment options, please call 515-421-4018 for an appointment.